Hanoi (VNA) – Permanent Deputy Prime Minister Truong Hoa Binh hosted a reception in Hanoi on January 29 for visiting Prosecutor General Moon Moo-il of the Supreme Prosecutors’ Office of the Republic of Korea (RoK). Binh hailed the RoK as the largest investor in Vietnam with two-way trade at over 64 billion USD. There are currently 50,000 Vietnamese brides among the over 160,000 Vietnamese people in the RoK. The host said Vietnam is stepping up the fight against corruption and has achieved important results. 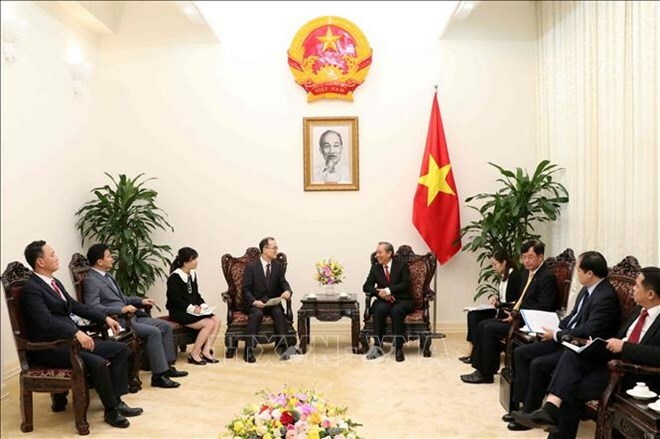 As Vietnam and the RoK are members of the United Nations Convention against Corruption, he suggested that both sides should uphold the spirit of preventing crimes and enhance international cooperation in the field. Vietnam is ready to partner with the RoK in line with the convention, Binh said. He lauded the Supreme Prosecutors’ Office of the RoK and Vietnam’s Supreme People’s Procuracy for signing the 2019-2022 cooperation agreement, and hoped that the RoK would assist Vietnam in studying legal institutions; training prosecutors; and adopting modern technology in the management of cyber, transnational, organised, drug and human trafficking, and corruption crimes. Moon wished that the Deputy PM would continue supporting ties between the Supreme Prosecutors’ Office of the RoK and Vietnam’s Supreme People’s Procuracy, and expressed readiness to share experience with Vietnam in anti-corruption. The guest also hoped that Vietnam will support the RoK build a peace mechanism for the Korean peninsula.